For Rhodes, heat mimics intense exercise. So to manage the warm weather and his diabetes, he focuses on staying hydrated. Also, because he is on insulin, he watches for sudden lows and keeps a sugar source nearby. What is Rhodes’ go-to sugar source? 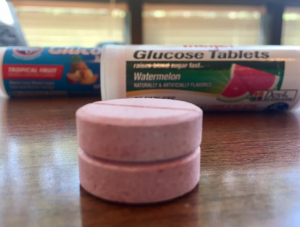 It’s Glucose Tablets, commonly found in grocery and drug stores. He keeps them at his desk at work, in his jacket or pant pocket for when he is on the run, and in the car (another benefit, they won’t melt). And they come in a number of flavors! He also brings glucose tablets or liquid glucose pouches with him when out for a jog or working out. Unlike sugary drinks or candy, which his body has to digest and process, these forms of straight glucose raise his blood sugar fast! Check with your doctor to find out if glucose tablets are a good option for you. What is a strategy that works for you to manage diabetes in the heat? We would love to hear it!